← Getting dirty is fun…. Maya is making progress in her puppy training and her behavior is improving quite a bit…. My wild child is becoming not so wild. 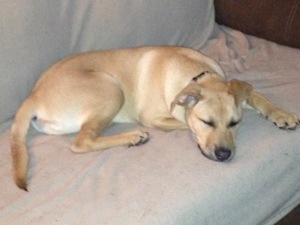 Here she is enjoying a nap on the couch (a rare moment)… She is growing up fast! This entry was posted in Maya and tagged behavior, dogs, pets, Puppies, training. Bookmark the permalink.